The world is full of truth, goodness, and beauty - and each of those play a beautiful role in the New Evangelization. Today, I'm sitting down with Jill Simon from Pink Salt Riot and visiting with her about the role that beauty plays in evangelization. Jill recently launched a course on branding for Catholic social media influencers. It's the perfect course for anyone who owns a small business, blogs, or works in ministry. It's a beautiful course that will help you "shift your focus off your own needs and desires for your business on to the tremendous potential your business has to be the hands and feet of Jesus in the world." 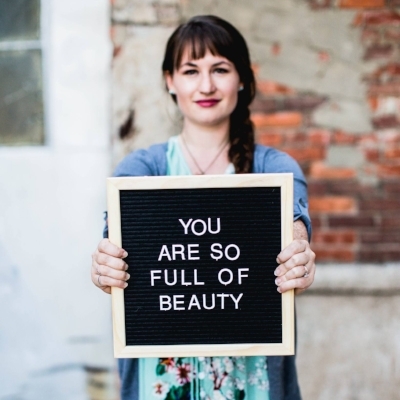 I first encountered Jill through her small business, Pink Salt Riot, and I'm so excited to share her love of beauty with you! Can you tell us a little about your life as a Catholic artisan? As a Catholic artisan, I see my art as an extension of my faith. I really wouldn’t know how to separate them even if I had to. Even when I am making things with little or not spiritual content the essence of how I create is formed by the person I am in Christ. I also believe that as an artisans we are special stewards of the beauty our world is looking for. We have a responsibility to spread and share that beauty through our work. What role does beauty play in evangelization? Bishop Barron has an amazing talk about this from last year’s LA Congress. He tells this wonderful story about being wooed by the splendor of major league baseball as a child, which ultimately leads him to dedicate a large part of his childhood life to the practice and study of baseball. It was the beauty that drew him in and grew that desire to learn more. Then he was properly disposed to receive the less exciting rules of baseball and the tedium of practice with joy because he had this clear picture of the beauty of baseball realized in it’s highest form – the major leagues. It’s the same with the faith. If we show people the beauty of life in Christ (ultimately the saints and Christ Himself) they can be so much more disposed to receiving everything else that is a part of Catholic life – the dogma, Scriptures, and moral life. What inspires the creation of your pieces at Pink Salt Riot? I am inspired by the women I see living their lives full of faith in the desert of our modern world. I deeply desire to serve them and give them touch points in their life in that desert – tiny reminders of what they are living for and why. There are seriously the most amazing Catholic women in our Church right now. It is really incredible. Can you tell us a little bit about your brand new branding class? My new Branding Class is called “Branded Beauty: Branding for the New Evangelization.” It focused on defining your gifts and charisms as a road map for how God is calling you to serve, discerning who you are most called to serve, and figuring out how to connect the two. That’s branding. Branding is the bridge that translates what you are offering from you to the people you serve. And that’s precisely why branding well is essential to communicating our faith well with the people we serve. If we aren’t communicating our businesses in a way that reaches people where they are, they’ll miss us. Our message will never be heard. Good and beautiful branding is one of our most valuable tools to cutting through the noise of modern life and bringing people in. You have gifts that need to be given and things you need to say! Want to sign up for 'Branding Beauty' and dig into the gifts that the Lord has blessed you with? Join me in this fantastic class by clicking here and using the code HALFOFF to get 50% off the class through April 30, 2018!